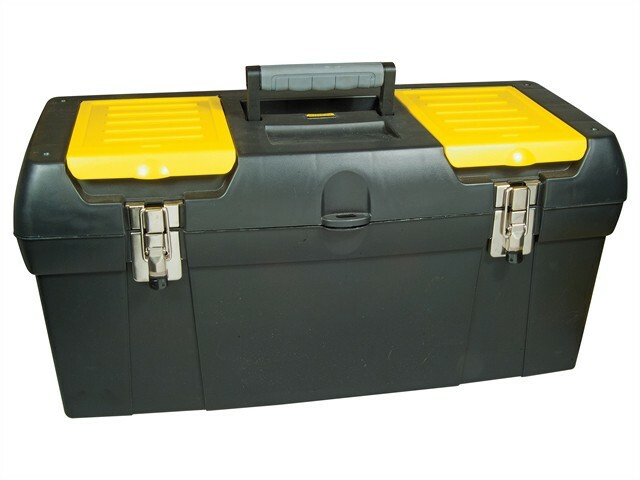 This series 2 Stanley toolbox is made from a tough durable plastic and will store a great range of tools for easy transportation around the home or work site. There is a tote tray inside and two twin handy storage compartments on the lid for smaller tools or fixings. This Stanley tool box gives good accessibility to your tools. Equipped with a strong soft-grip handle that makes it comfortable to carry, and two metal catches. The toolbox can be locked with a small padlock for extra safety and to reduce the risk of theft. Ideal for transporting and storing multiple tools. 1 removable tote tray for storing small tools. 2 organiser for screwdriver bits etc.